Our Impact Factor (IF) is calculated according to the standard formula published by Wikipedia and Clarivate Analytics (previously ISI) as follows. A = number of times articles published in 2015 and 2016 cited in 2017. B = the total number of articles published in 2015 and 2016. A/B = 2017 impact factor. 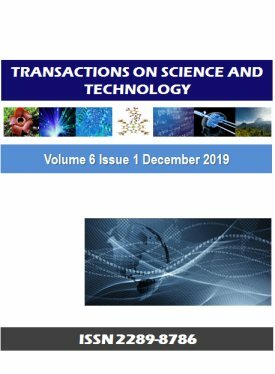 Transactions on Science and Technology is an independent journal devoted to the prompt publication of original papers in basic science disciplines, their technological applications, the dissemination of scientific knowledge and technological knowhow, and the impact of science and technology to human, which includes economics. The journal seeks to promote and disseminate knowledge among scientists and engineers by providing a medium by which the results of their research can be brought to the attention of the world's scientific communities as well as public as a whole. The journal was established in 2014 with its first issue published in December. Two issues were published on the following year in 2015. In 2016, the journal was published in three issues: in April, August and December, and two special issues on Science and Natural Resources (June 2016), and on Marine Science and Aquaculture (September 2016). From 2017 onwards, the journal was published in four issues in March, June, September and December to meet requests from authors for rapid publication of their paper. As part of our effort for improvement, we have moved our website to new domain, http://tost.unise.org/. We have also changed our publisher, now under UniSE Press, the publishing division of the United Scientists and Engineers International or UniSE International. In this coming few months, you might experience invalid URL or internet link and some of the website functions are not working. Please email the Editor-in-Chief at jed[at]ums.edu.my the detail of the problem for rectification. Currently, we are setting up an online management system to manage paper submissions, reviewing processes, and publication of journal articles for Transactions on Science and Technology. We decided to use Open Journal System from Public Knowledge Project for efficient management of your submission in the future. For the time being, article submissions can be made through the Online Submission system here. Additionally, beginning 2018, review report by referees could be submitted online through our submission form. 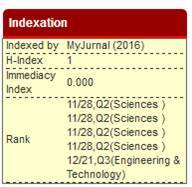 In 2016, Transactions on Science and Technology was ranked 11th (Q2) out of 28 in Malaysian scholarly journals in Sciences, and rank 12th (Q3) out of 21 in Engineering & Technology. Most-cited articles from the journal are updated instantaneously based on citations to online articles by Google Scholar. Check them here. Next issue will be published in April 2019 (Volume 6, No 1-1: Advances in Science and Technology 2018).